MIAMI—Scientists have confirmed for the first time that radical changes of one volcano in southern Japan was the direct result of an erupting volcano 22 kilometers (13.7 miles) away. 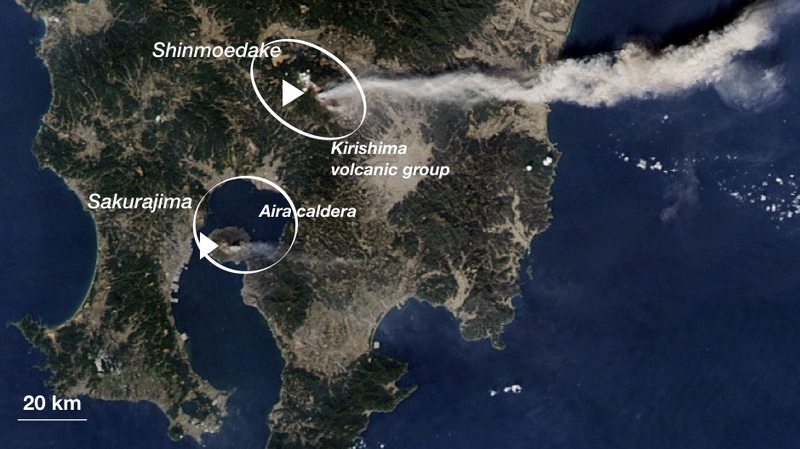 The observations from the two volcanos—Aira caldera and Kirishima—show that the two were connected through a common subterranean magma source in the months leading up to the 2011 eruption of Kirishima. The Japanese cities of Kirishima and Kagoshima lie directly on the border of the Aira caldera, one of the most active, hazardous, and closely monitored volcanoes in southern Japan. Identifying how volcanoes interact is critical to determine if and how an eruption can influence the activity of a distant volcano or raise the threat of a new strong explosive event. The research team from the University of Miami’s (UM) Rosenstiel School of Marine and Atmospheric Science and Florida International University analyzed deformation data from 32 permanent GPS stations in the region to identify the existence of a common magma reservoir that connected the two volcanoes. Leading up to the eruption of Kirishima, which is located in the densely-populated Kagoshima region, the Aira caldera stopped inflating, which experts took as a sign that the volcano was at rest. The results from this new study, however, indicated that the opposite was happening—the magma chamber inside Aira began to deflate temporarily while Kirishima was erupting and resumed shortly after the activity at Kirishima stopped. “Now, we have to look whether this connnection is particular for these volcanoes in southeastern Japan or are widespread and occurr around the world,” said Amelung. The study, titled “Geodetic evidence for interconnectivity between Aira and Kirishima magmatic systems, Japan,” was published June 28 in the journal Scientific Reports. The coauthors include: Elodie Brothelande, Falk Amelung and Zhang Yunjun from the UM Rosenstiel School of Marine and Atmosheric Science and Shimon Wdowinski of Florida International University. The study was supported by NASA’s Earth Surface and Interior Program (grant #NNX16AL19G).